Hey there, Happy Weekend! It's hot, the pool is cool & we're going to enjoy this long last weekend of Summer as much as we can. Today I have Week 28 to share of my Project Life. 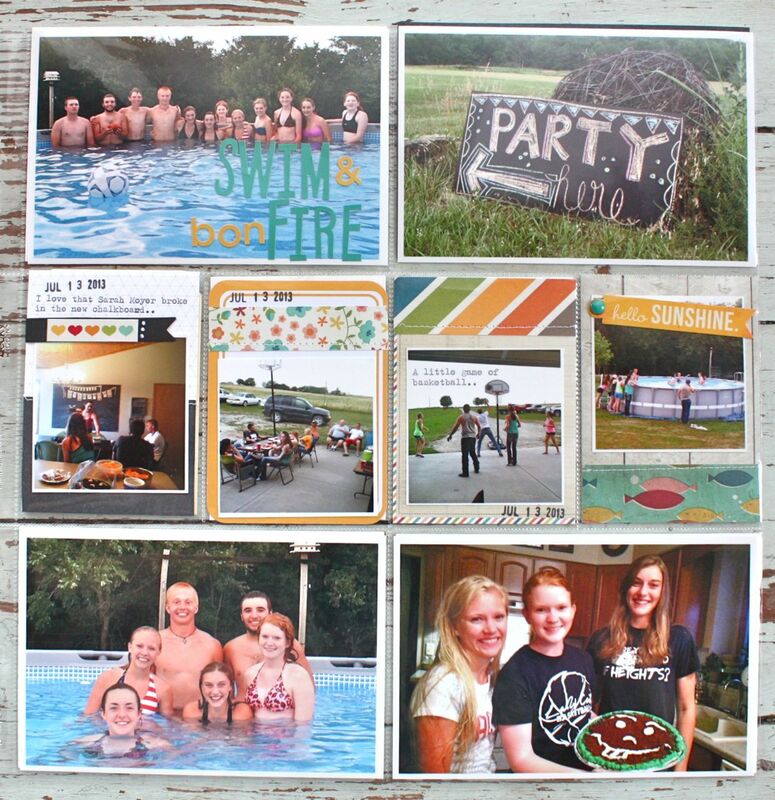 We had our annual swim party and bonfire with lots of kids. I didn't take too many other photos for the week so the party photos were good fillers. 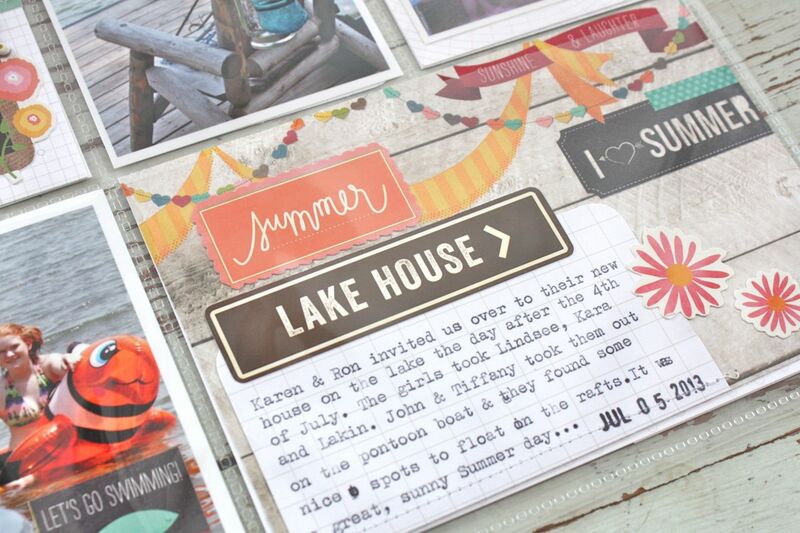 I used lots of the Simple Stories product from some previous Gossamer Blue kits. Love those warm, Summery colors. Lots of 4 x 6 photos on this side so I used 3 x 4 filler cards to add some color. Loved this main, dated insert. 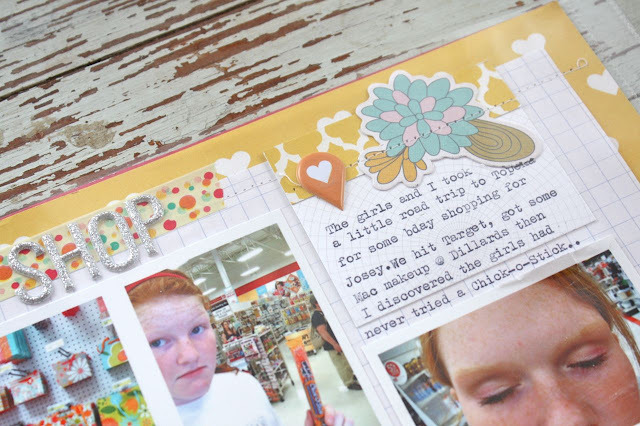 That little Simple Stories postcard was a favorite. Here I posted a photo that I took last year of my Uncle Bob. He passed away during this week of my Project Life. I wanted to post a good photo of him before he got too ill. Loved this one of him and my aunt with the girls. 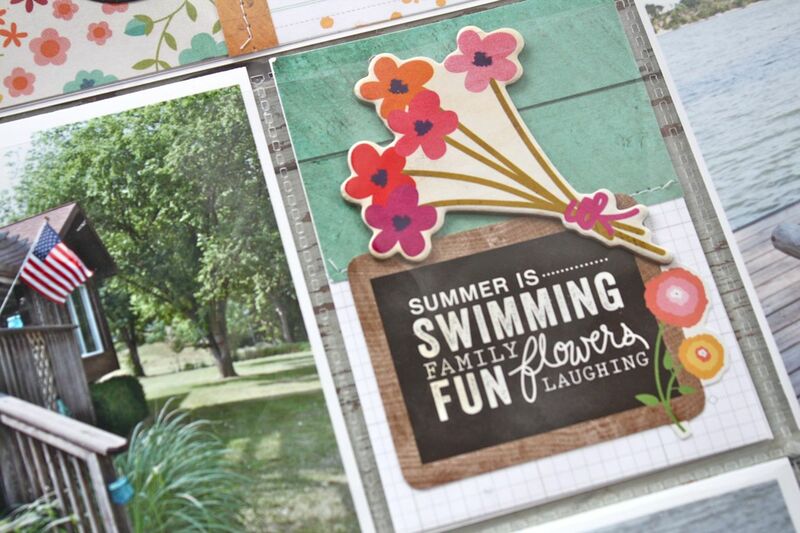 This quote 3 x 4 card made it's way onto a 4 x 6 insert. It was perfect for Jordan's "swiggle" line. 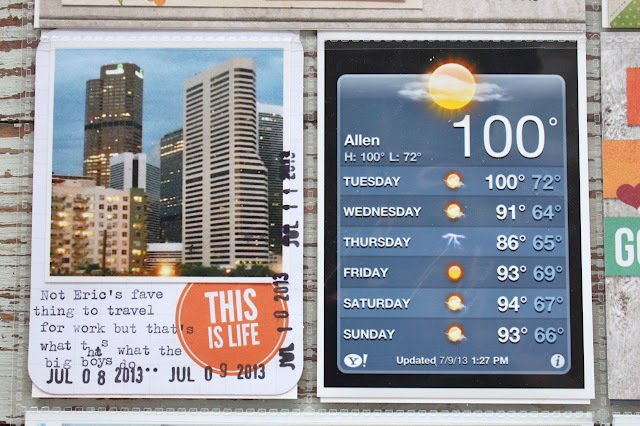 Here we have a photo Eric took while in Denver on business + the weather report. Hot! 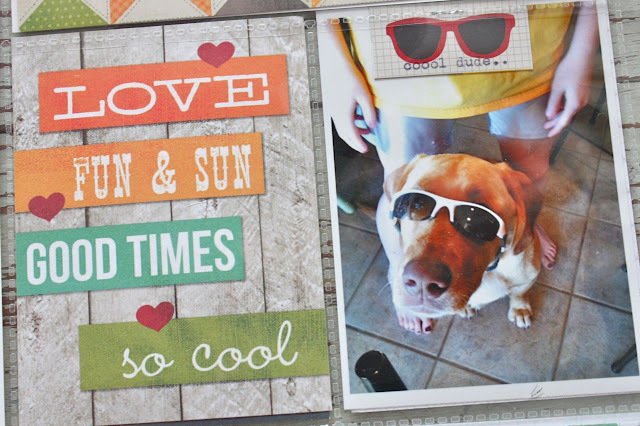 A fun filler card from Simple Stories + a fun photo of Charlie. He'll do anything for a snack. More party photos......the girls will love all these photos of them and their friends when they're older. 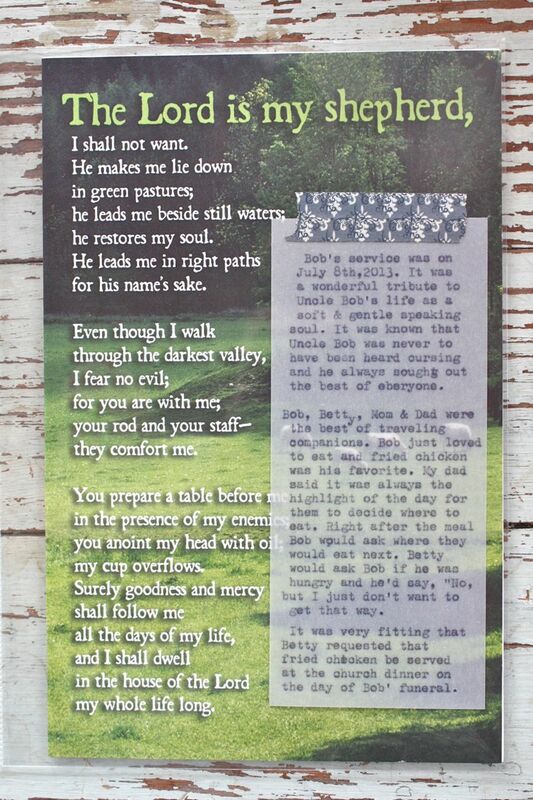 I have an insert this week that I used to hold the papers for Uncle Bob's funeral. It was such a lovely service for such a kind hearted man. I wanted to tell some stories of Bob so I used a piece of vellum to add some typewriter journaling. It was a sad time for us to lose Uncle Bob. 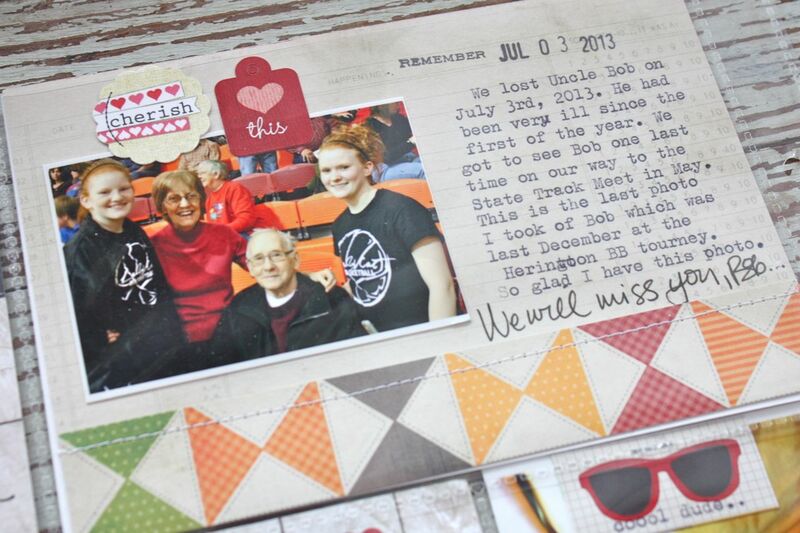 We will miss him so much......and this is why I scrapbook. To remember the moments....document our lives....share our stories....take the photos. Love this hobby so much. Hi all. As I'm getting back into the swing of things as the girls are back in school, I'll be focusing more on my shop and fun blog posts. 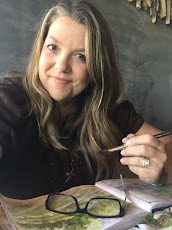 I'll be bringing back the Friday Favorites posts which will include good junk finds, awesome recipes, great Pinterest finds and more. 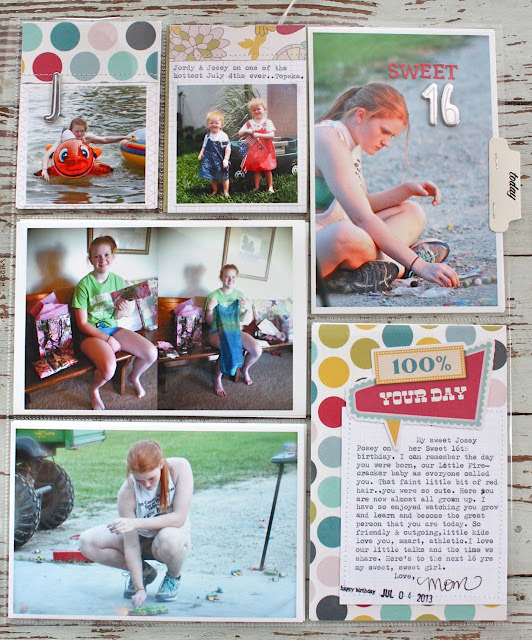 I'll have more cards and packaging items up on the blog in addition to my Project Life posts. It's going to be a great Fall season and I hope you'll join me. 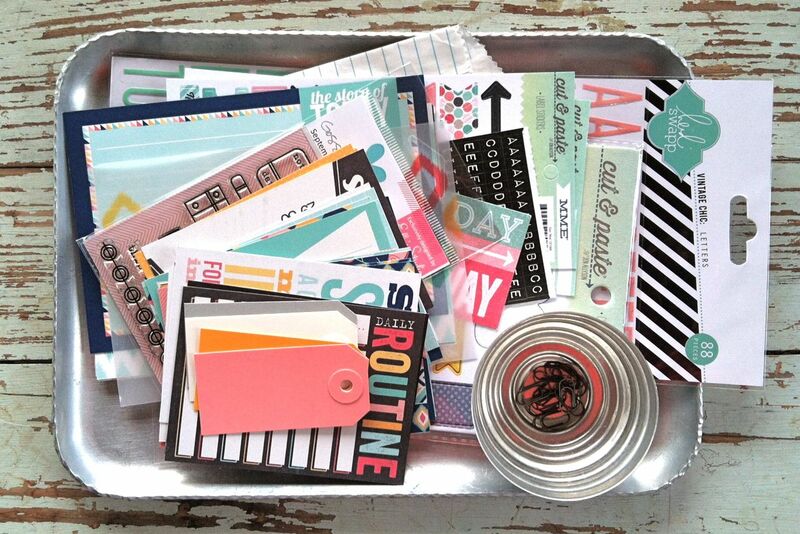 When doing a little work for my online business, I realized that I have over 100 items in my shop! 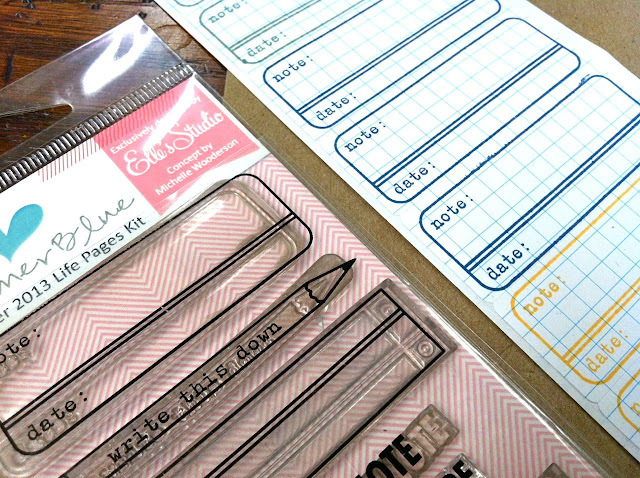 Many of those items are staple items that I keep stocked on a regular basis. Other items are little kits & cards & special finds that I put in the shop in very limited quantities. Sometimes those speciality items sell out quickly & I get emails asking for more quantities. 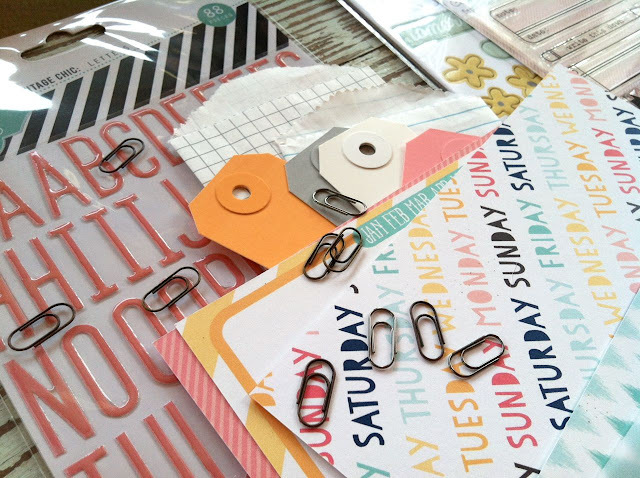 Sometimes I can accommodate and sometimes it's just a one time deal, depending on quantities of supplies on hand and if I feel like creating more items. For those items that are listed in limited quantities, I'm going to start listing them as a Boutique Item. The Boutique Items will be listings that are very limited in quantities and perhaps a creation that I devoted a little more time to. 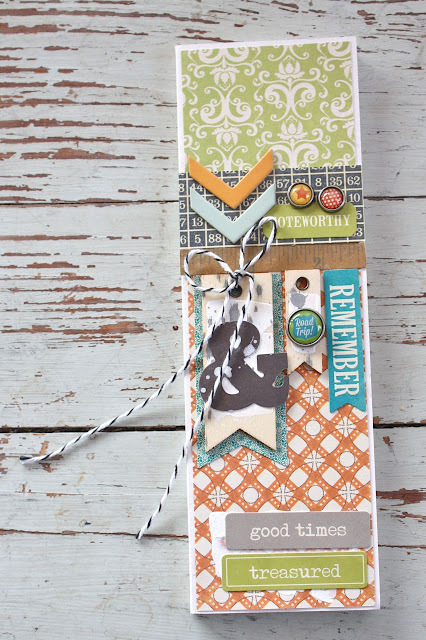 The Boutique Items may be a special project that I created using a featured product in my shop. They may be a limited quantity of some great vintage find. 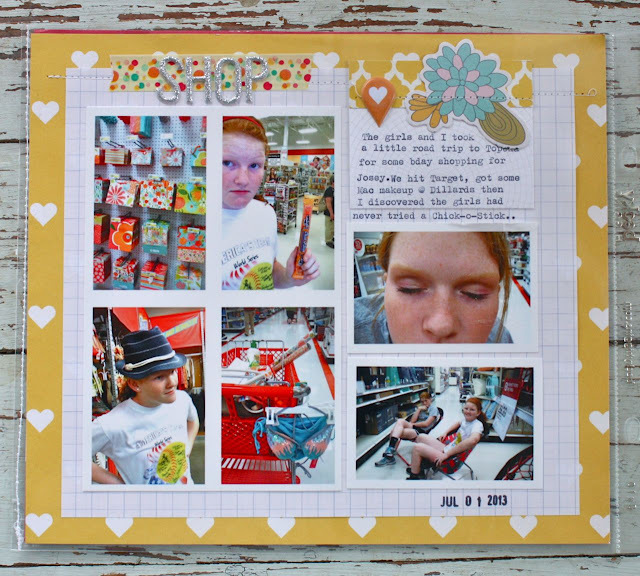 Whatever the case, my hope is to showcase those Boutique Items here on the blog in a special way. So stay tuned for my Boutique Item featured posts. Today's Boutique Item is set of gift sacks that I created using the Gray Polka Dot Gift Packaging up in the shop. With the little kit you get a fun little bundle of supplies to create a unique gift sack for that special present. 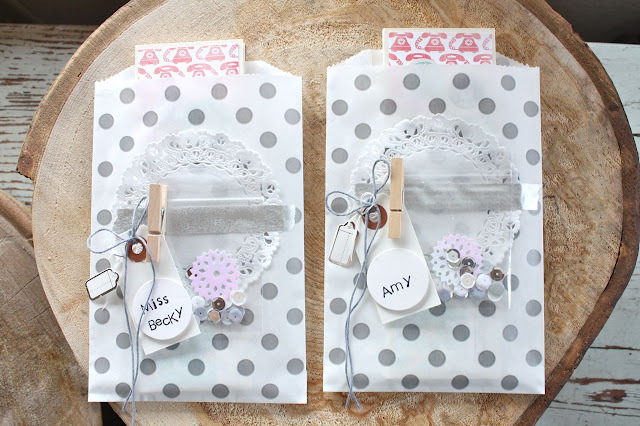 Today I created 2 of the gift sacks to hold some notebooks that I created for my two favorite secretaries at the girls' school. They are nicest ladies & always give a shout out to my girls as they pass through the halls. They deserve something special. 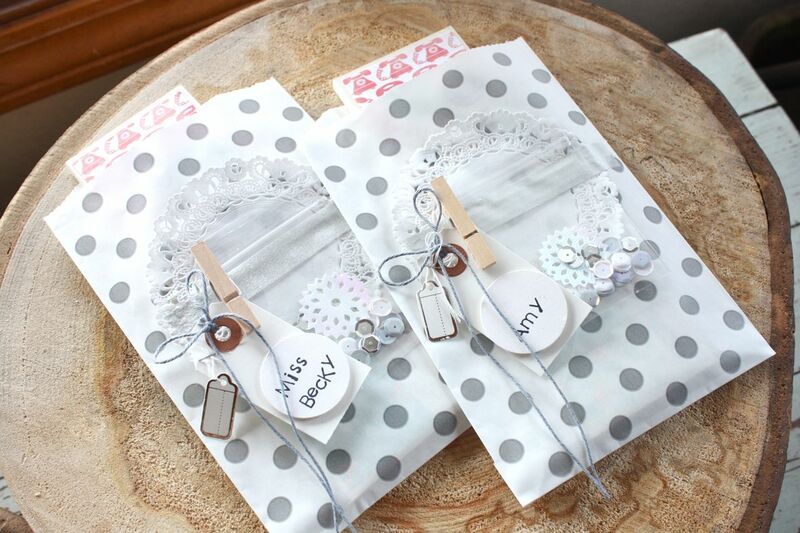 On my gift sacks, I used every little item that is included in the little kit. I adhered the Dainty Doily to the sack. 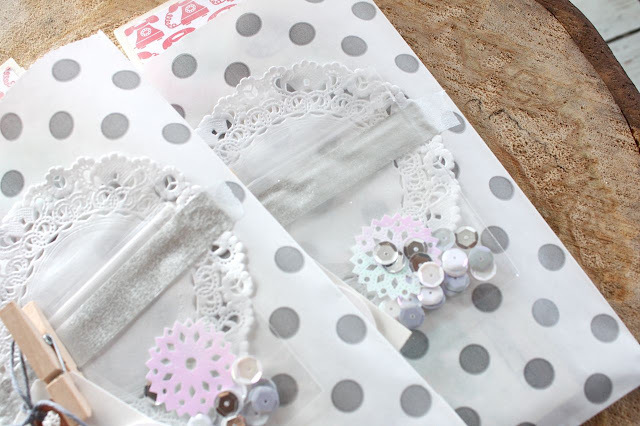 Then I used the Small Clothespins in a fun way.....I added double sided tape to the backs of them and adhered them right to the doily. 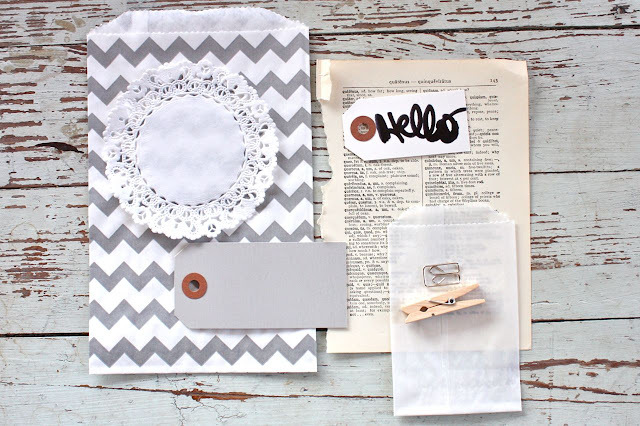 I tied the gray twine and tiny little silver tag to the Small White Parcel Tag. 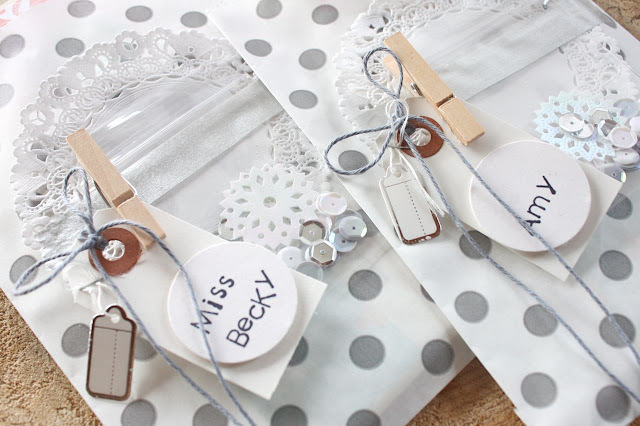 I used some white cardstock, a circle punch and wood letter stamps to create the name tags. I then placed all of the sequins into the clear cello bag & adhered that to the top of the doily with the silver Washi tape. I tucked in the cute notepads (which you'll see in September for the Gossamer Blue release) and they're ready for the girls to take to school. 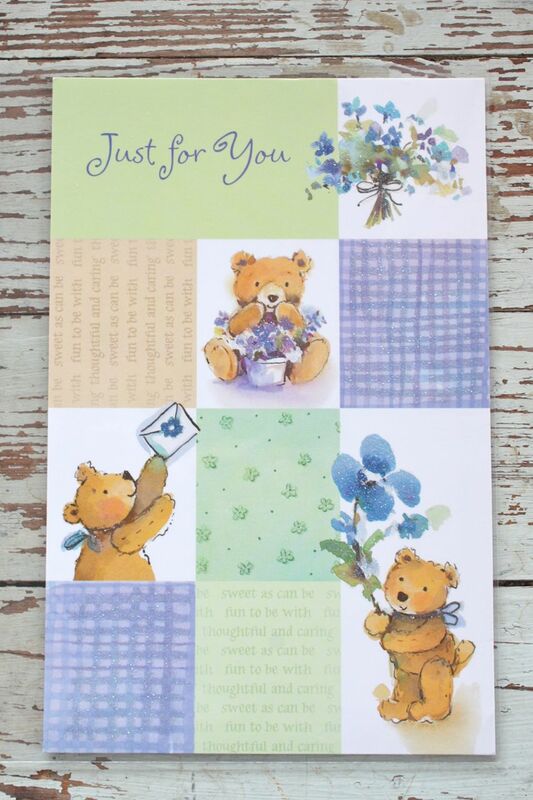 Boy, doesn't it make you feel good to create a gift for someone special. I need to do it more often. I hope you'll enjoy my Boutique Items posts & everything else that is to come this Fall. I've got a few more Boutique Items up in the shop currently which include my Special Delivery Gift Packaging kit, my Hello Gift Sack Kit and Vellum Pocket Inserts. You can see them in the main shop HERE. Have a great day everyone. Project Life Week 27....where I fit 51 photos into my week! Yep, you read that right. 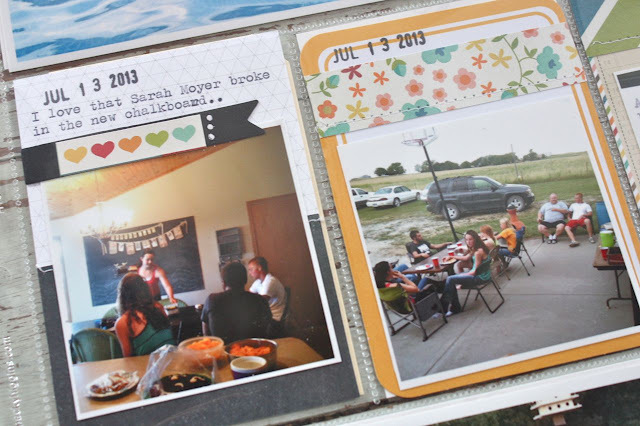 I fit 51 photos into this week's Project Life. The week surrounding the 4th of July brings about my mom's birthday, Josey's birthday, July 4th celebrations lots of Summer activities. 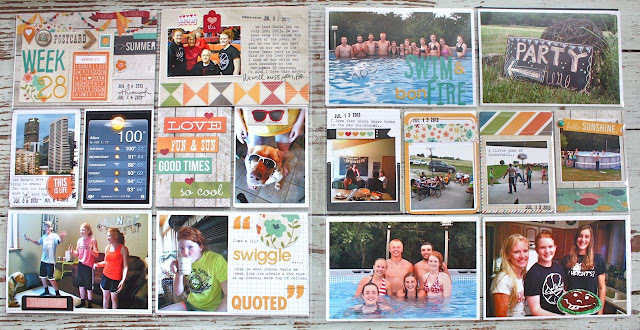 It was a huge undertaking deciding where and how to add all the photos but I separated all the photos into their own little sections by activities and slowly but surely I got the week completed. I have a full 2 page spread and 3 double sided inserts for this week. These photos were the everyday happenings and most of the photos of Josey with her friends. First up are the inserts in the weekly spread. I created my usual dated insert with the week # and the dates. 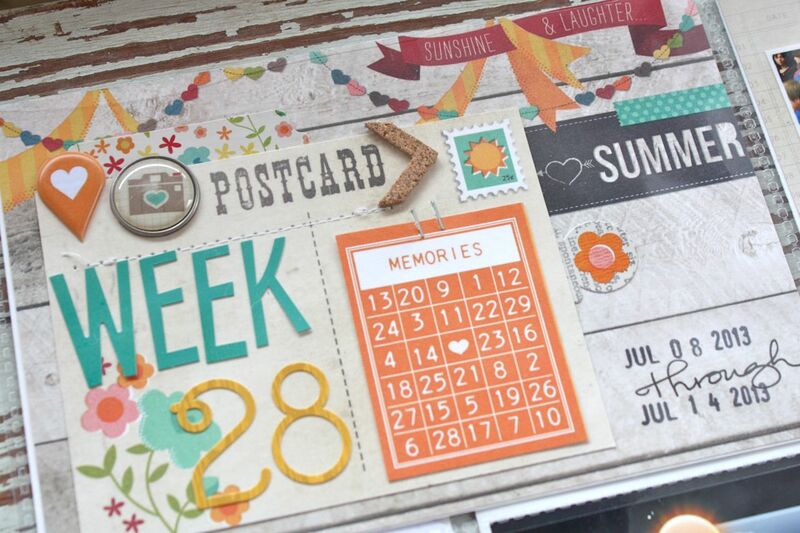 All of my inserts for this week were created using Gossamer Blue kit items from past kits. 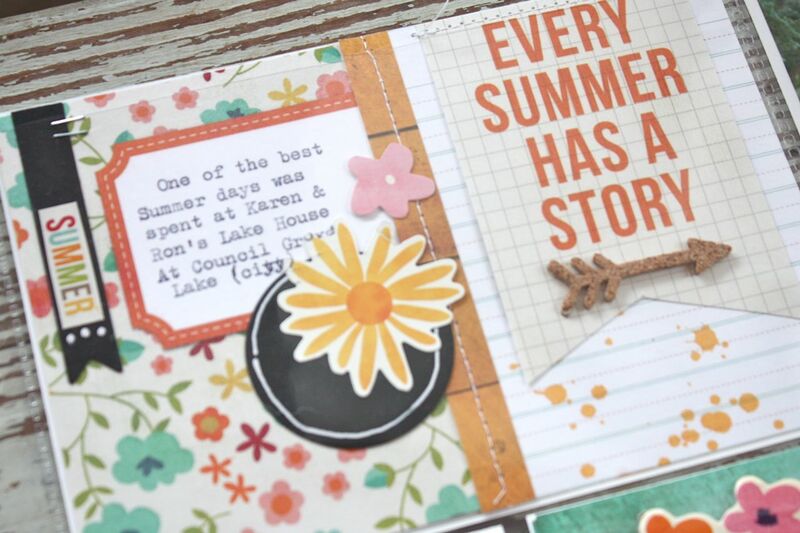 I used lots of of my handmade journaling card using Fancy Pants papers and accents that I had previously made. This made it very easy to to pick journaling cards and saved time on adding lots of accents and embellishments. 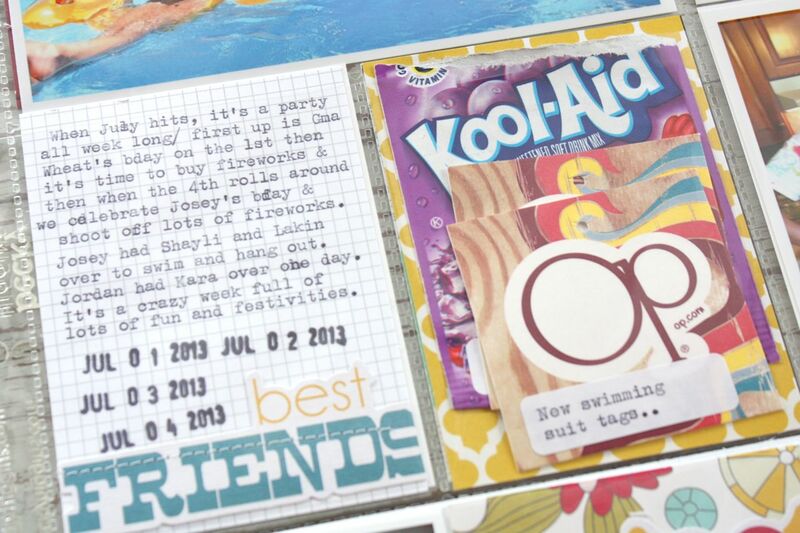 Loved adding the Kool-Aid packet the girls used to dye their hair + a saved a few tags from Josey's new swimming suit. Here we go with the 3 inserts. 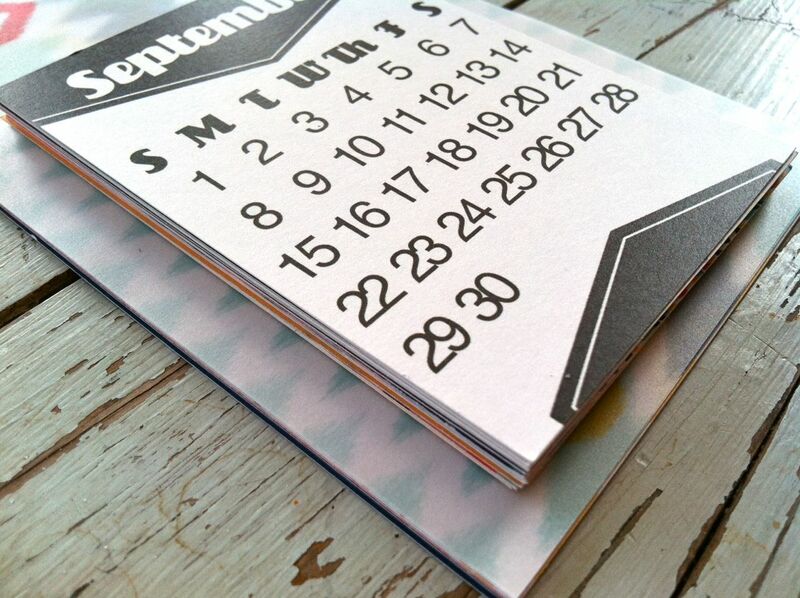 As usual, I like to keep my inserts smaller than 12 x 12 if possible. 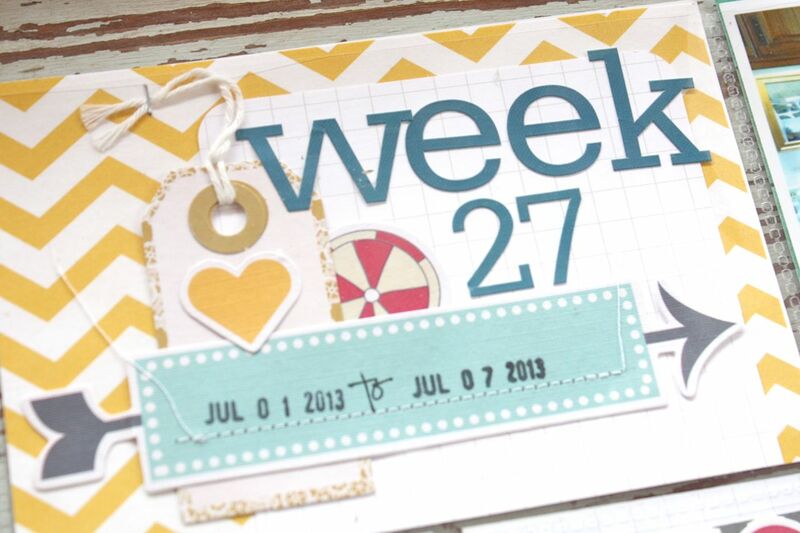 This way the weekly spread is largest and can be seen. 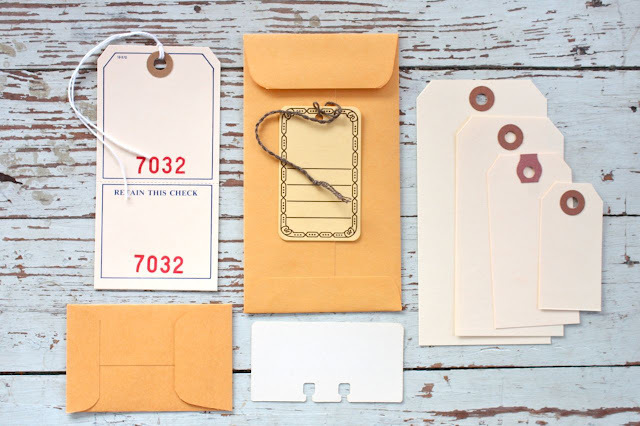 The smaller inserts are sandwiched in between from smallest to largest. This is the smallest insert. 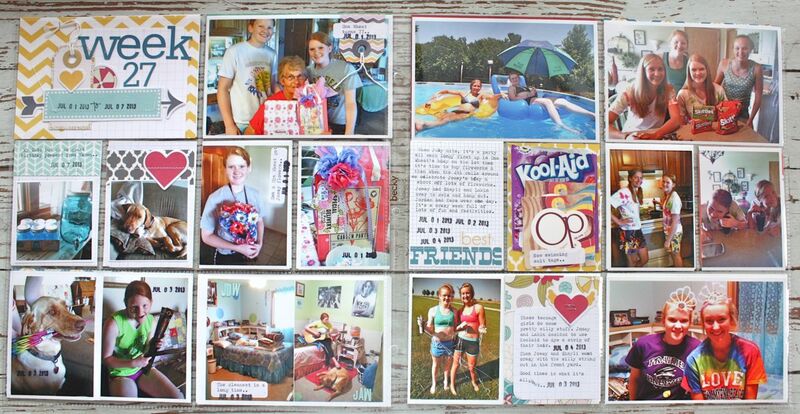 I used a 6 x 12 page protector and just trimmed it down to the height of the birthday card. 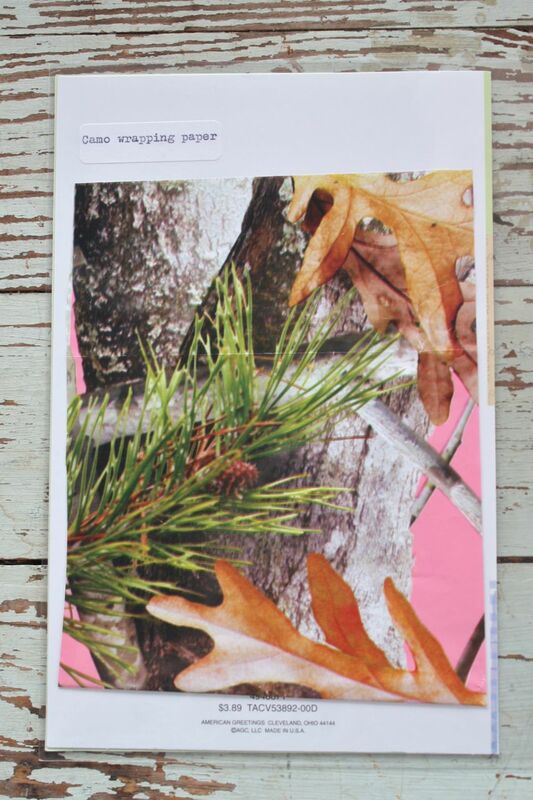 I added some of the wrapping paper from Josey's gifts on the back side as filler. Here's insert #2, the front side. 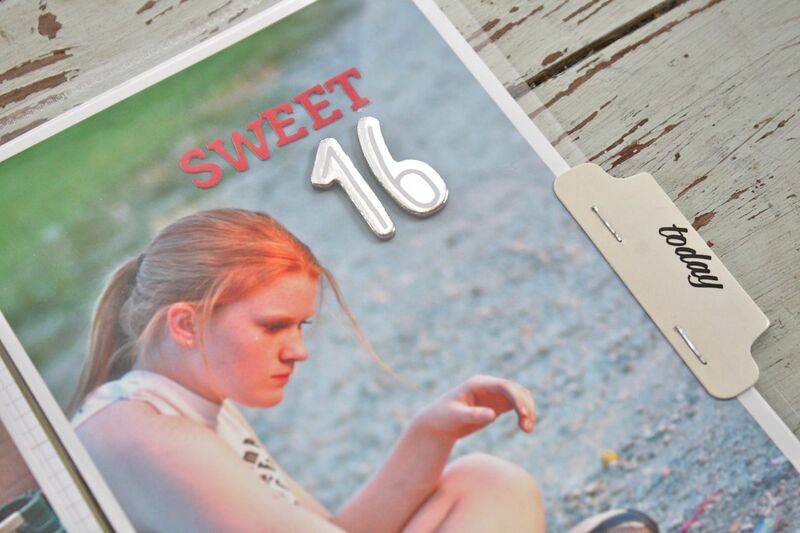 This is all about Josey turning sweet 16. 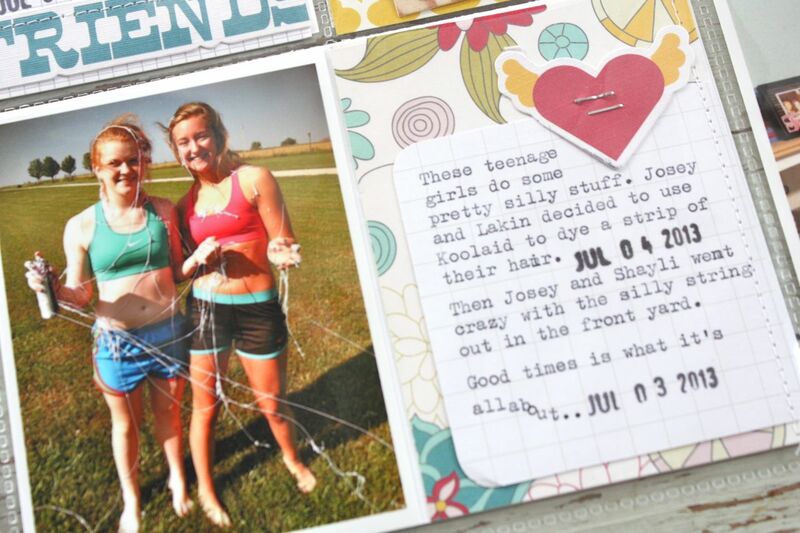 I inserted some of my favorite photos of Josey from this week + a little flash back photo of the girls on one of Josey's earlier birthdays/July 4th celebrations. I typed a special note for Josey. 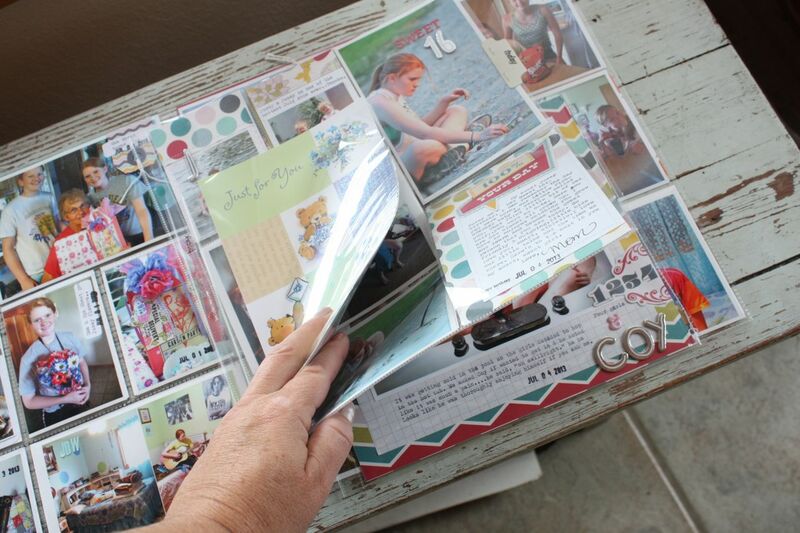 I now always write the journaling in my albums from my view. Love this sweet photo of my Josey Posey. Little wisps of her strawberry blond hair, sitting by herself working on those smoke ball chains she makes every 4th of July. This is the back side of the above insert. Look at all the dang photos! I take a ton during the fireworks and I always want to include them all. 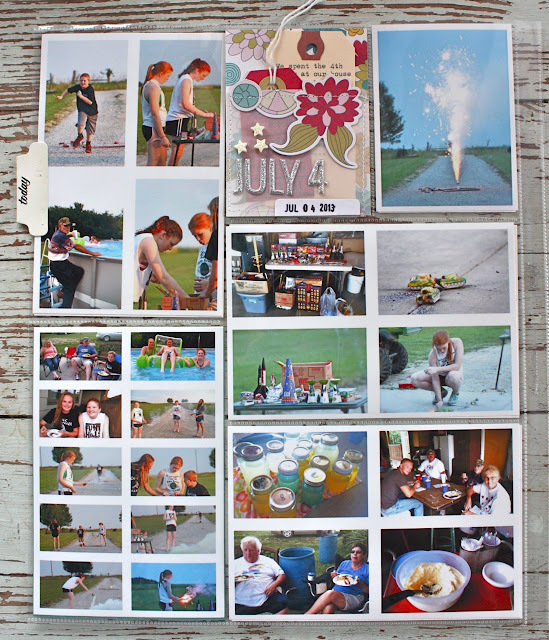 I made photo collages using my printer program, selecting the number of photos I want on each 4 x 6 sheet, then adjusting the size until they all fit. 23 whopping photos in this insert. I used this pocket insert I created earlier for the main decorative element. 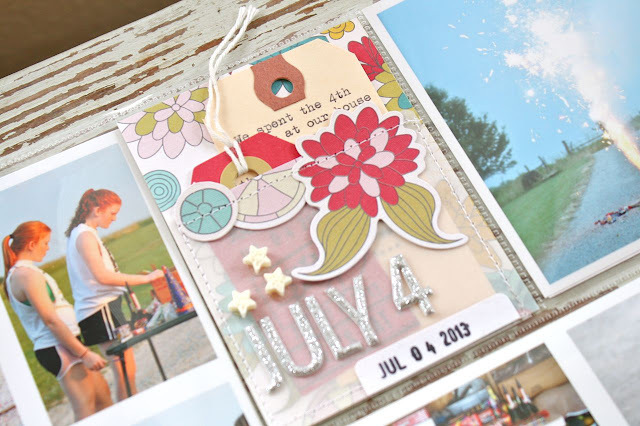 Some sparkly letters & resin stars help add to the patriotic theme with out being too 4th of July-ee. The 3rd insert which is an 8 x 10. I just couldn't help but add in this last photo of the night. 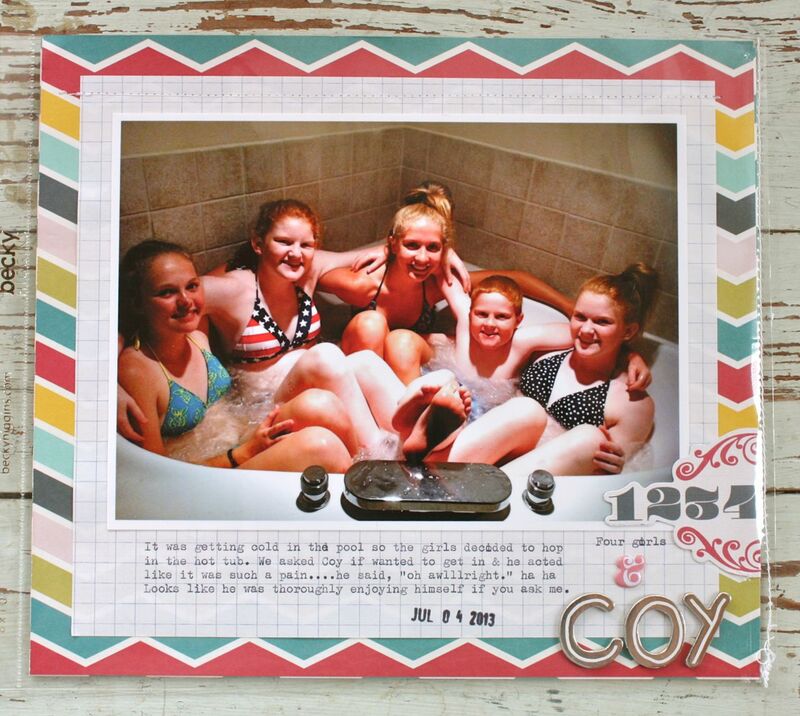 The girls and their friends were all swimming...along with Kara's little brother Coy. He's quite the ladies' man and didn't bat an eye when it was time to hot tub. Little stinker, watch out girls! I used the 1,2,3,4 to note the number of girls + Coy in big letters. This is the back side of the above insert. Totally random photos from a birthday shopping trip for Josey. The photos were so bright and colorful, I had to add them to this week. I trimmed down an already made journaling card to fit the space. We hit Target, the Mac makeup booth and Michael's. I found out that the girls had no idea with Chick-o-Stickers were. That had to change. They weren't the biggest fans. Whew, so glad that these photos are all in the books. Typically these types of weeks are overwhelming so I just put them off.....until it's weeks or months or years down the way and I don't have the big moments accounted for. 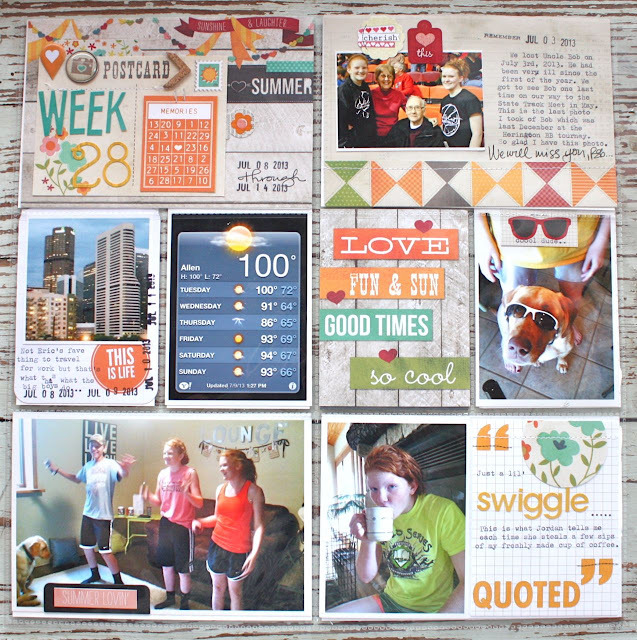 I decided to change that and I really, really try hard to complete my inserts at the same time I do the weekly layout. I love how my album looks with all the smaller pages. It totally encompasses our lives. 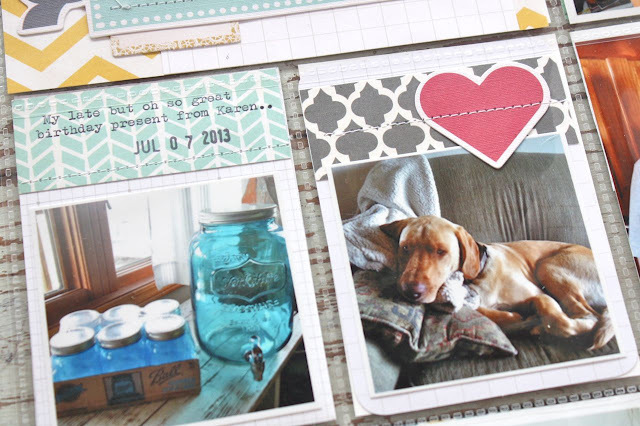 Today I'm sharing the cover page for my second album of Project Life for 2013. 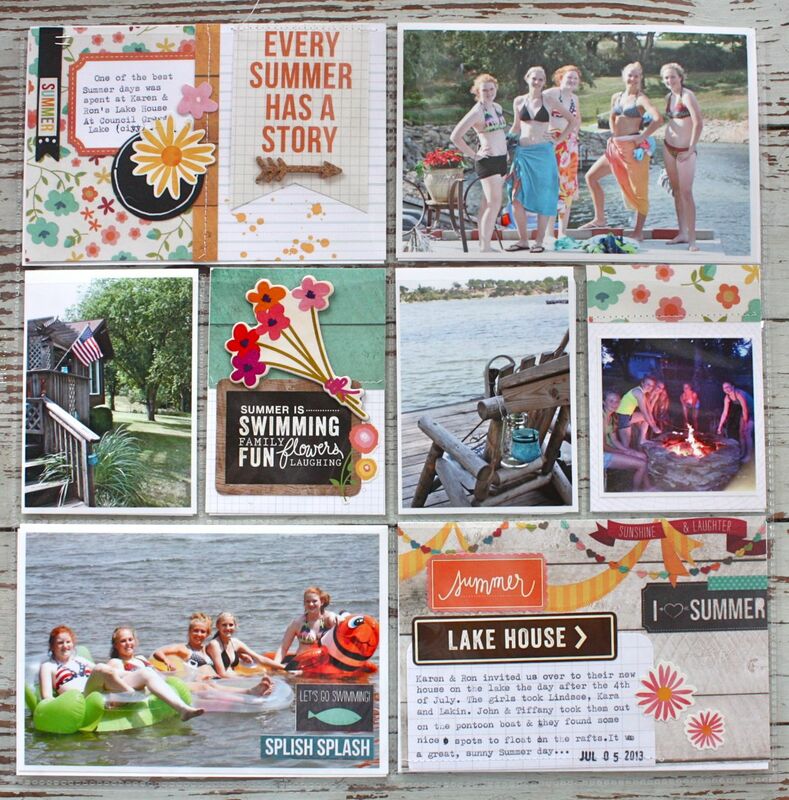 The photos from this insert were from a fun day at the lake & I didn't have a spot for them in a regular week. So I thought an entire page dedicated to these fun photos would make a good starting point for album #2 which heads straight into Summer. It's a one page spread using elements from Simple Stories and Pebbles. 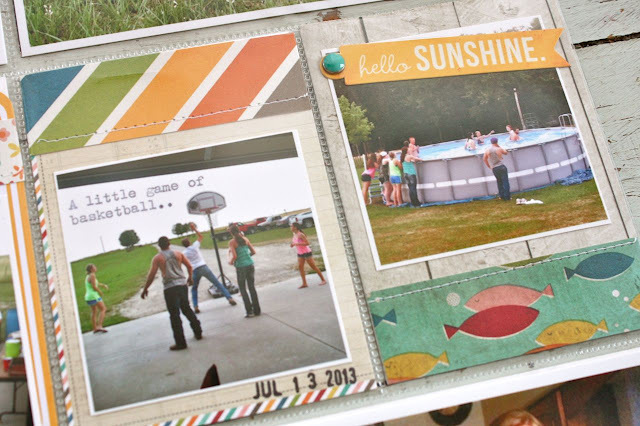 The photos are some of my favorites which just capture the girls' Summer perfectly. 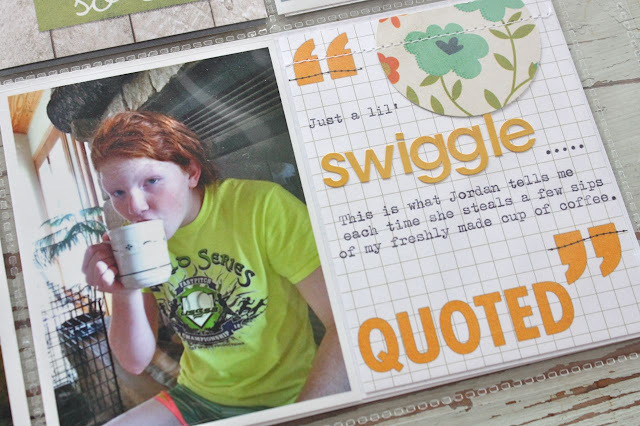 I had created this 4 x 6 insert earlier and thought it would make a perfect little title insert. Loved the saying on this sticker and the flowers were a bright, fun element. Another 4 x 6 insert which notes the journaling about our day at the lake. TGIF everyone! Hope you're planning for a great weekend. My girls are looking forward to relaxing after a long week of 2-a-day practices and their first 2 days of school. I'll be happy to have everyone home for the weekend & plan on doing some grilling and baking. I've also got new, fresh paint and I'm so very excited to start painting a few rooms in the house + the interior of the Airstream. I seriously love to paint. Oh, and I have a new color for the front door just in time for Fall. 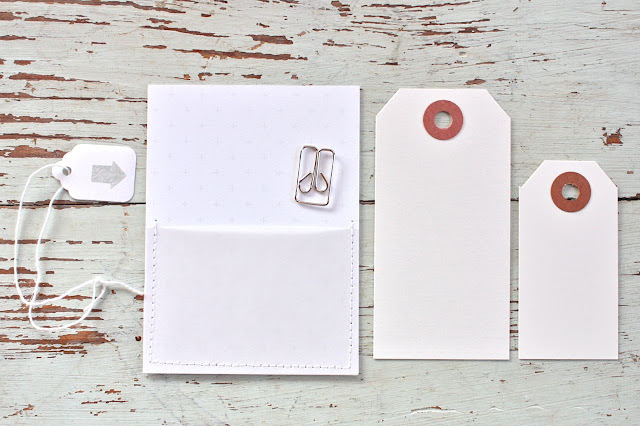 This fun little pocket insert with a machine stitched vellum pocket. 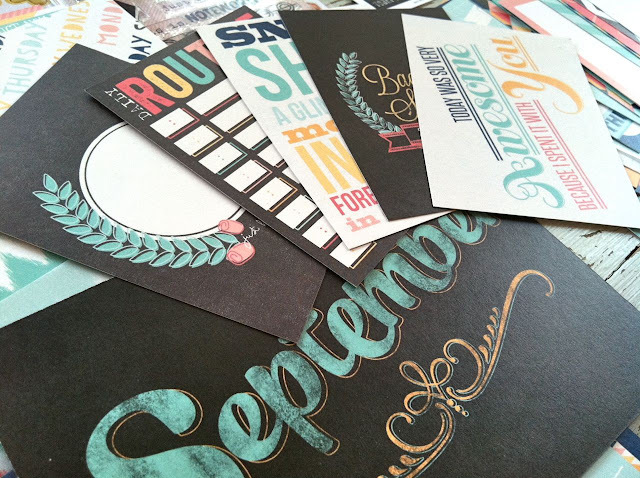 I've had fun using these in my Project Life pages this Summer. 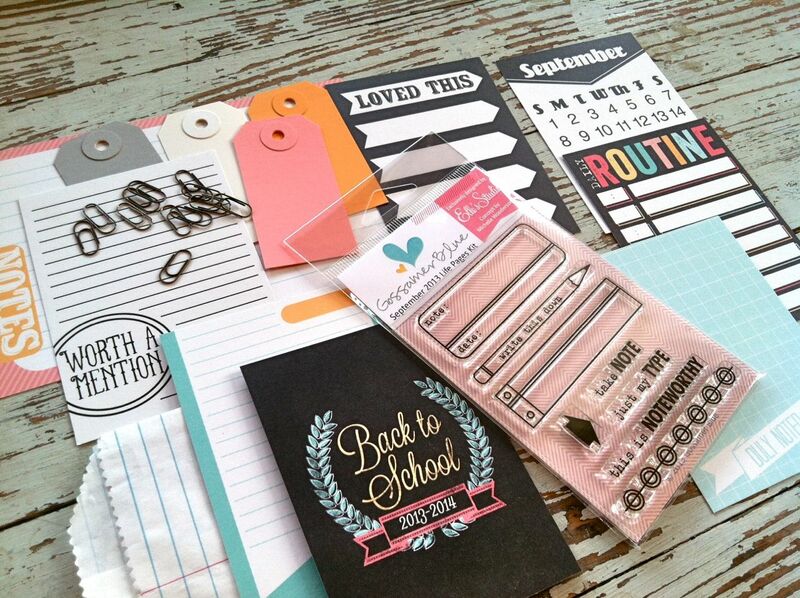 And a few gift sacks collections are trickling into the shop....back to school time always gets me in the gift giving mood. 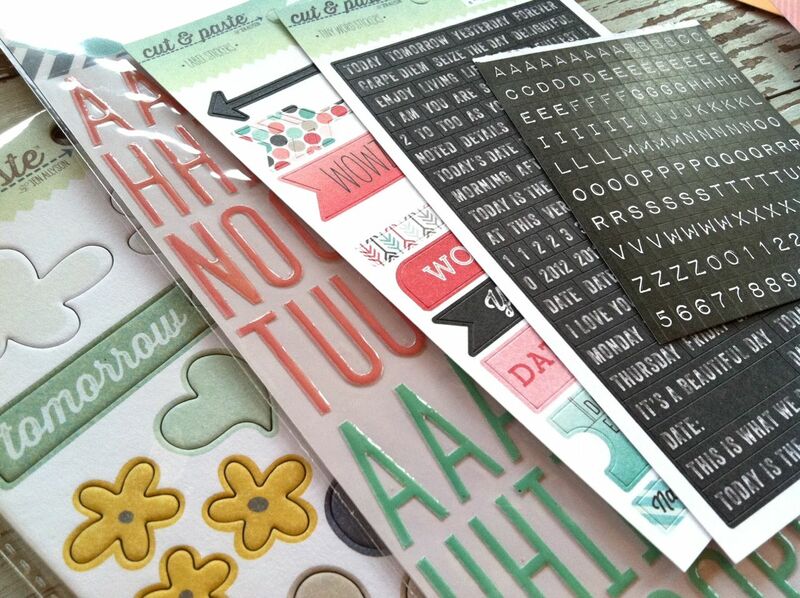 These little kits are perfect for creating some one of a kind packaging for cards, little gifts or treats. I've kept back a few for myself so that I can add some cards to them for Fall birthdays. Speaking of cards, I've some up in the shop now and will be weeding out my big stash over the next few weeks. I love to add a stash for my mom and Eric's mom for Christmas so that's an idea to think about. 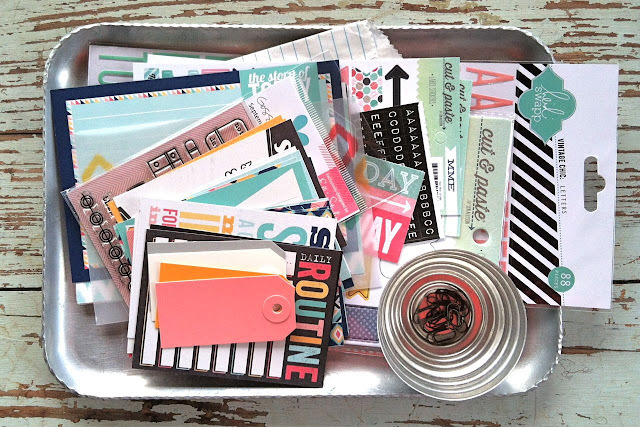 I just keep a box with dividers with their names on them and just add to them each time I make a set of cards or notebooks. Perfect gifts! Okay, I'm off to get ready for the weekend. I'm bound and determined to make Summer last just a bit longer. Edit: Someone asked "Do you use a typewriter to type your titles to those little cards? Just wondering but please let me know. I want to do something like that! ".....Could you please let me know some more specifics? I'm not quite certain what you're referring to. Are you talking about in these class photos? Another blog posts? If you're talking about my Project LIfe inserts, yes I use my typewriter a lot to type the journaling. Glad to help....just want to make sure I understand your question. Edited: The winner of the free class is Charlotte Brochu. Congratulations! I will be emailing you today with the class information. Today I have a fun prize to share. Please leave a comment at the end of this post and I will choose a random winner from the first 25 comments. Comment must include your full name and email address. Winner will be announced within the next few days. 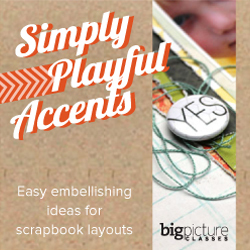 Up for grabs is a free class session to Angie Gutshall's new class called Simply Playful Accents. Would you like to add a bit of fun and whimsy to your layouts? 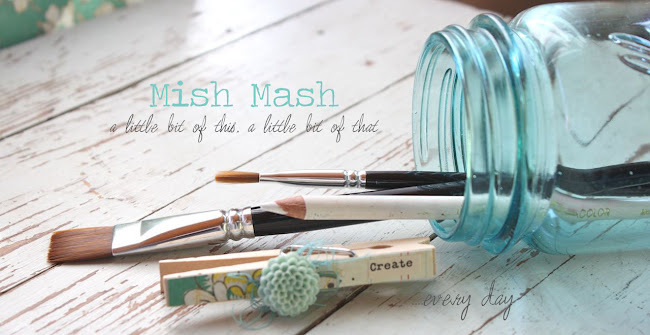 What if you could do it in a way that was not only fun and playful, but also simple! 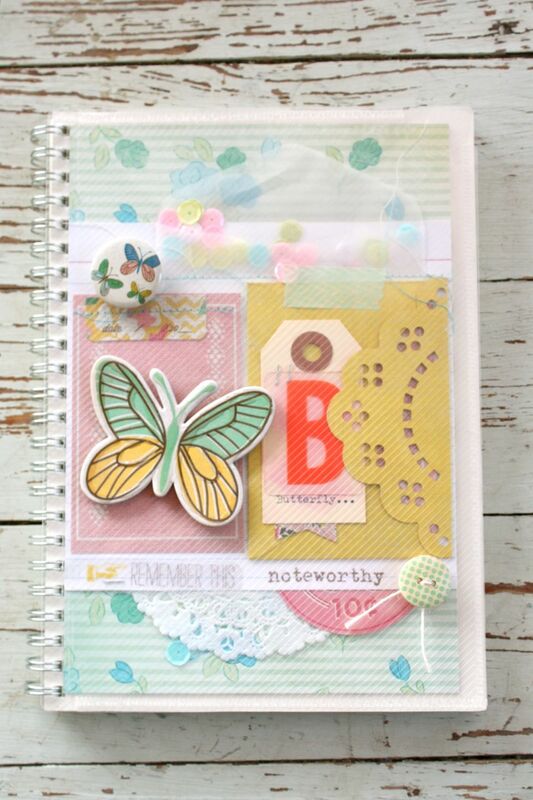 In Simply Playful Accents, instructor Angie Gutshall will share more than 20 ideas for using items in your supply stash to add a little bit of pizazz to your layouts. You'll receive 20 emails with before-and-after images, each showing how just adding a little accent here and there can take your layouts from blah to beautiful! 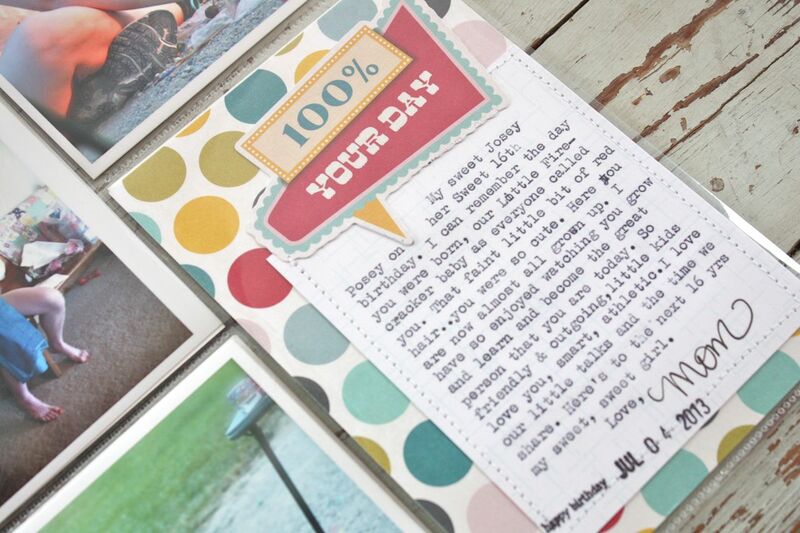 You'll also receive four bonus emails with additional ideas and inspiration. Angie even shares her layout-creating process in a fun video tutorial! Sounds like a fun class, enjoy! !